It is my very great pleasure to introduce you to our September Volunteer Spotlight: Jimmy! Jimmy consistently brings a community-minded, gentle blend of teaching to our shop and outreach program. 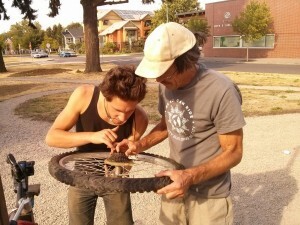 Always with a mind for empowering the individuals he works alongside, Jimmy uses his toolset of hands-on, explanation-based teaching to educate Portland residents, young and old, on bike maintenance and repair. We appreciate the passion and excitement that Jimmy brings to his work at the Bike Repair Hub in New Columbia, a space in which he’s given a lot of time and energy. I first heard of the Community Cycling Center about a year or so ago, through a friend that had been helping out occasionally. Having worked at a bicycle cooperative while in college, I was looking for a place where I could learn more about bikes and also contribute to the Portland community in a way that continued movements toward radical systemic change. I dropped by about half a dozen bike shops asking about work trades or volunteer opportunities, and everyone pointed me to the Community Cycling Center or Bike Farm. It took me a bit to get going. For some reason (probably somewhere between traveling and working) I kept missing the volunteer orientations. Last winter, around February, I orchestrated my ramblings so that I was in town during a scheduled orientation. On the way over, my bike promptly suffered a flat tire. Then, I missed the bus. Finally, I made it, about 40 minutes late. I’ve been volunteering with the Community Cycling Center on and off ever since. 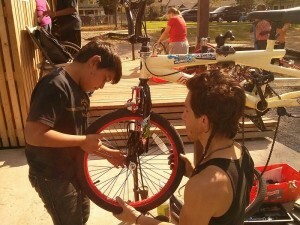 I started out dropping in on Tuesdays and Sundays, fixing up kid’s bikes and recycling old bikes. 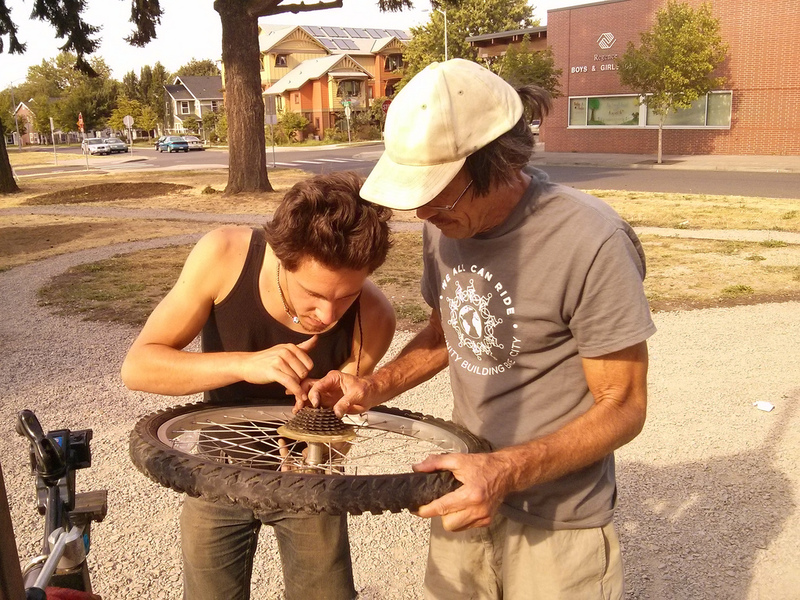 After about a month or so, Randi asked me if I wanted to help out at the Hub, a bold bike-repair outpost in North Portland that facilitates free access to tools and knowledge within the New Columbia neighborhood. I was excited to become a part of the endeavor. My shifts at the Hub generally involve channeling the excited DIY energy of young people. I can be found enlightening a novice mechanic to the innovative process of using a tire lever (instead of a wrench) to change a flat, demonstrating how to align a rear wheel and rig a coaster brake, pointing out which spots need grease, recommending that valve stem caps be placed in pockets so they don’t get lost, and so on. There is also the occasional instance of improvising functional components with miscellaneous parts. Between the two jobs that inconveniently have me elsewhere on Sundays and Tuesdays, I’ve slowed in becoming a consistent face at the Drop-In Nights at the bike shop, and most of my volunteer work is at the Hub, at least for now. I get around the city almost exclusively by bike, on a rickety and at times surprisingly trusty, old, and red Bridgestone step-through that I found on Craigslist for $100 and fixed up a little bit. I’ve caught myself telling people things like, ”I don’t ride my bike everywhere because I can’t afford a car; I ride my bike because it’s important to me that there’s one less car out there.” And yeah, I also appreciate the wind and rain in my face – even in winter. I like the Community Cycling Center because its programs support that kind of stubbornness. More broadly, though, the Cycling Center’s mission of expanding access to alternative forms of transportation is something I believe in deeply. It’s inspiring to me to be hanging out at the park or wherever and witness ten or twenty cyclists go by in just a few minutes. It’s a thrilling moment to become part of a bike swarm that grows and grows until we suddenly realize the possibilities of an urban community built around human-powered drivetrains instead of internal combustion engines. As one of a great many details in re-imagining our relationship with the earth, we need access to bikes and the means to maintain them. The Hub. I must admit that I often find kids to be a lot more fun than grown ups – or at least, the playful and joyful spirit of experimental curiosity is an attitude I like a lot. It’s not every day that I get to support someone through a trial-and-error learning experience that involves installing the rear wheel in backwards and then realizing that the chain doesn’t work that way. I enjoy practicing as a bike mechanic, and I also like that at the Hub I’m more than a bike mechanic. In fact, when I’m at the Hub, I try really hard not to fix bikes. 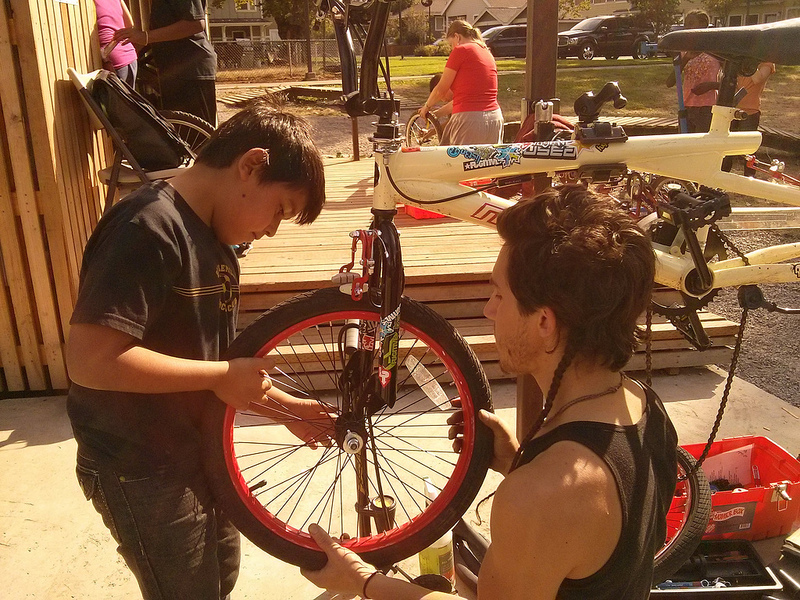 Instead, I strive to teach people – mostly youth – how to fix their own bikes. I’ve heard it said that if we can’t fix it, we don’t own it, and that resonates with me quite a bit. The capacity to repair our stuff is empowering on both a personal and collective level, and I support projects with that aspect of vision. Further, in my view, the socio-political topography of the Hub subverts some of the ways in which access to alternatives are so often cut with various strains of privilege. In other words, if you’re around and have access to a bike but can’t afford to fix it or just don’t believe in turning knowledge into a thing that can be bought and sold for profit, come to the Hub. Or if you want to come help people work on their bikes, that’d probably be cool, too. Do you have a dream bike? If so, what is it? It takes a minute to answer this one. I think my dream bike is a grungy-looking thing, built up entirely out of spare parts scrounged from all over. It would have a rear hub and cassette that was a gift in exchange for helping a buddy move, a rack that was broken but a friend had welded back together, fenders I found in an attic that fit perfectly, and 27’’ tires that were a little beefier than standard (so I wouldn’t fret in the least about hitting some of those dirt roads that pop up now and again around here). Each spoke would be individually salvaged from old wheels; they would all be a little different but the wheels would still spin true. The frame’s paint would be chipped, and the frame itself would be rigged to carry a trailer sometimes. The whole thing would be well taken care of; I’d have access to all the tools and knowledge to keep everything running smoothly, so much so that people would take it for a spin and be filled with joy. The frame would also be able to magically transform into a sleek tandem. Likewise, the fork and rear stays would be able to spontaneously clear balloon tires for when I needed to bomb down some dunes somewhere in Uruguay or California or zoom across the Playa. These days most of my time goes to collaborating on a kid’s program at Lent’s Farmer’s Market called Food Scouts (Bike Camp field trip?!) and work-trading with an herbalist – in exchange for helping out with garden and urban farming projects I get to learn all about herbal medicine. I’m participating in putting together a new collective housing outpost in Portland, and also clocking in part time at a local bakery – the night shift, which is nuts. Sometimes I worry that I’m working too hard and not playing enough…I imagine it’ll balance out soon. If a movie of your life were made, what would the title be? Who would play you? I don’t know what the title would be. I imagine it’d be directed by Ulysses Pascal, an old friend who is currently working on a Kickstarter project documenting the fiber optic cable that runs from New York to Chicago and the materiality of the Internet (excited to see it when it’s done!). What I’d hope is that a cinematic interpretation of my life would be some kind of colorful surrealist ethnography, and that it’d go easy on the excerpts of home-video childhood footage. I think I’d have to play myself, right? Maybe someone who looks like me would get commissioned for a few re-enactments. And there’d be a Trickster figure.